"Greensleeves is famous for hosting medieval feasts, weddings, conferences, product launches, exhibitions and school tours in a setting, which can only be described as an English country paradise. 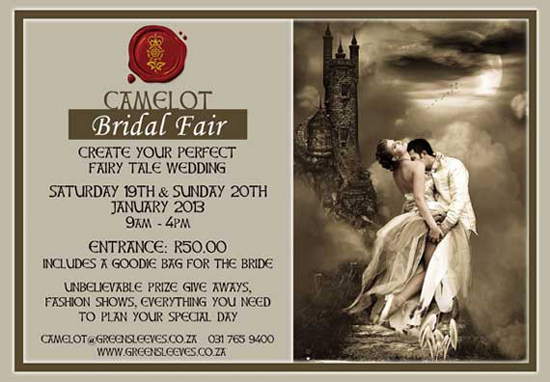 Set in Camelot Estate in Hillcrest, the exhibition will be situated in and around the castle, setting the tone of romance and of a dream come true “fairytale wedding”. The magnificent venue is guaranteed to enhance your experience creating an inspired, relaxed atmosphere to shop. Exciting activities throughout the two days….fashion shows, unbelievable prize give-aways, professional MC, entertainment and more will ensure that you have a memorable experience! From food to flowers, bridal wear, décor, cakes, DJ’s, honeymoons and much more, you’ll find here! Relax and enjoy the superb food to be served in our courtyard tea garden.